Educating Via Live Raptors /Hawks Aloft Inc.
Diurnal raptors show sexual di-morphism in size. The females can be up to 1/3 larger than the males, depending on the species. We love to show comparisons among the species and among individuals whenever possible. We often take two or more of the same species to an event so folks can ‘really’ see the differences. 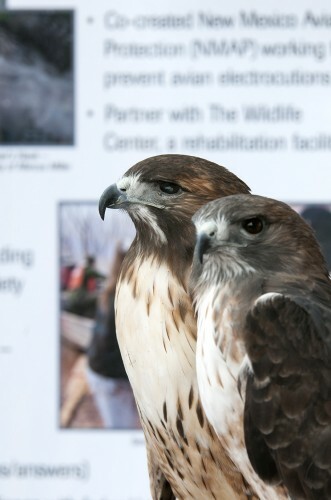 At Festival of the Cranes at Bosque del Apache NWR our two Red-tailed Hawks sat side by side on the same perch. The size difference is clearly visible when they are this close together. These two birds, Jamaica (female), and Quemado (male) have shared living space in their expansive outdoor flight cage for many years. Both are the calurus subspecies, or typical Western Red-tailed Hawks, exhibiting the characteristic belly band and dark head typical of this subspecies.